With the development of society, females nowadays have better education, and therefore, they have more chances to enter the workforce. Based on analysis of the Statistical Bureau in Taiwan, the employment rate of women has increased 5.4% in the last 20 years, and it shows that the employment rate of women rose to 50.74% in 2015. According to the Department of Household and Registration, Ministry of the Interior, the average age of women giving birth is between 30-34 years old. However, when or if these employed women start a family, double-income families will face a problem: who can take care of the babies? Since both parents have jobs, they are unable to look after their children all the time; as a result, more and more parents nowadays tend to hire nannies to mind their children while they are at work. In one case, a baby girl died at her nanny’s house. Mr. Kuo, a 32-year-old engineer and his wife, are married for six years. They had their first son a year after they got married, and two years later, they had a twin sisters. Since both Mr. Kuo and Mrs. Kuo had to work, they were unable to personally take care of the three children during the daytime. As a result, they hired a nanny, Mrs. Lin, to take care of the three children, Jacky, Monica, and Jessica. However, everything changed on a Wednesday morning. “I got a phone call from the nanny, and she told me that she was in the hospital because Jessica stopped breathing after she was fed,” Mr. Kuo said with a trembling voice. Unfortunately, Jessica died that morning. Mr. and Mrs. Kuo rushed to the hospital. Jessica’s autopsy report revealed that her death was an accident: she had choked on milk and suffocated. Despite the tragedy, Mr. and Mrs. Kuo continued to have Mrs. Lin look after Jacky and Monica. They completely placed their trust in her. I asked them about their continuing faith in her. In fact, there are plenty of similar cases about accidents happening to infants when they are under the nannies’ care. No matter whether the nanny intentionally mistreats or abuses the baby, or there are real accidents, the situation is indeed a concern for parents. Therefore, many couples nowadays choose to let their parents, that is, the child’s grandparents take care of their babies. They think that family is more trustworthy than non-related people, and that grandparents love their grandchildren without a doubt. To be better prepared to take care of infants, many people take nanny classes recently. Held by the Department of Social Welfare with the support of Sunny Social Welfare Association, a non-governmental organization, nanny class is now very popular among people who want to become professional babysitters and those who are about to take care of their own children or grandchildren. Mrs. Yang, a sixty-year-old housewife, has just received her certificate from nanny lessons, and is now taking care of her six-month-old grandson, Happy. Mrs. Yang has raised three children on her own. It is not a new thing for her to take care of babies, so why did she take the course? “The main reason why I took part in the class is that I want my grandchild to have the best care,” Mrs. Yang replied. To be qualified to receive the certificate, the members need to take 126 hours of classes, including 7 credits of different courses. The content of the nanny course is diverse: Development of Infants, Introduction to Children and Youth Welfare Act, Designing Environment and Activities for Infants, Introduction to Babysitting and Professional Ethics, Parenting Education etc. There were 50 members in Mrs. Yang’s class. One-third of them were grandparents like her, and the others were young parents and people who wanted to be professional babysitters. 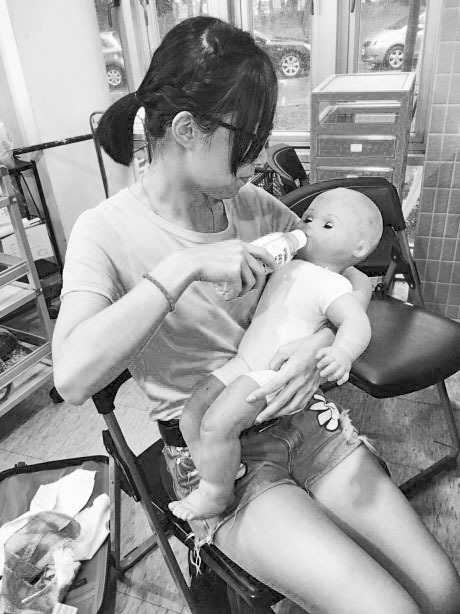 According to Mrs. Yang, they have plenty of in-class activities and practice, like how to hold the babies in the right way, how to wash the babies’ hair, how to feed them milk, chest care after feeding etc. There are also exams to make sure that they really learn what is necessary.